Why this articles is here? 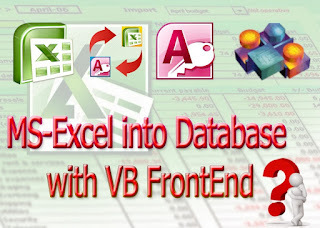 MS-Excel into Database with VB FrontEnd: As we all know that Excel has many features, formulas, commands etc., and is very powerful, reliable software, MS-Excel mostly use in everywhere for reporting, data storing, formulating, and many more purposes. Is MS-Excel is good for your most important data or files? Wait and think about that! Accidentally or mistakenly key-pressing can replace your cell value without your knowledge. Sometimes on a computer table you have many documents/files/books etc., if any document touch the keyboard key then the same condition is happened, (replace the cell value). If you required a report from your sheets with a specific condition just like a date range, or data range, or any other conditions, you must use many filters, hide columns or rows, or etc., main point is this that you spent much time for your reporting. If you want your excel sheets or files for reporting so you can not obtain your complete requirements because MS-Excel have some limitations/restrictions in formulas. If there are too many excel files/sheets and you compiles all the sheets or files in a single file or sheet you must be care for all your files/sheets. Unable to remember all the files locations and cell references during load of work. If you design a sheet with deadline, excel can not popup the remaining deadlines. Simple is that in my opinion MS-Excel is not good for your most important and precious files/data because MS-Excel has no control the accidental key-pressing and reporting require much time. There is a most precious thing you waste, which is "TIME"
In my jobs/services, I have waste many time and facing too much problems for losing data from my excel files/sheets by accidental key-pressing or any other way. 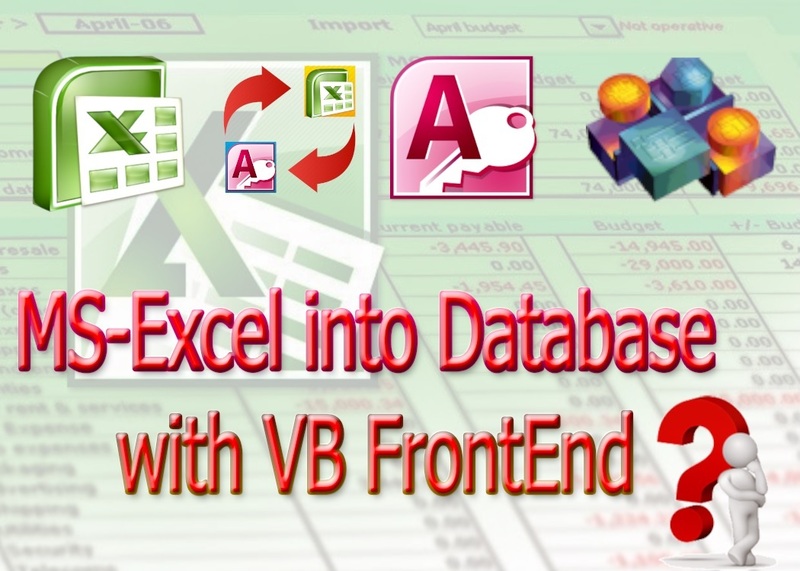 Finally I have decided to convert my all MS-Excel data into database and design a VB FrontEnd. Now using of this small software I am full comfortable from my data and reporting, I save much time and and no problem about work load. I can made new entries, edit entries, delete entries also with this software. You don't need to update the excel files much more. This software can be use with multiple user by local sharing, automatic popup to concerned users about the remaining jobs, intimate the head of department about their performances, and many more features I have use in this software on my and my management requirements. Storing data in database safely and also with multiple checks. No one can view/see my data without my permission. Or whatever I want to share with others they only view that part instead of all data. I am tension free for losing my data because there is a control for deletion and edition in data. My data can be Export into MS-Excel, PDF, or other reporting formats. Reporting formats are already design one time in my software, so you don't need to waste your time on each time to generate report. Sharing my data with others with controls or limitations, also intimate/highlights the required/remaining jobs/works. Supervisors also monitor the performance of users. Design a report generator for their monthly, quarterly annually, periodically and different data and different conditional reports as management requirements. Design a Program for record their generation hours and plant outage with multiple conditions. Design a leftover/unusable material record database with multiple reporting. If you want to convert your MS-Excel files / sheets / date into database and design a FrontEnd so contact me via my email: alijan_fs@hotmail.com.